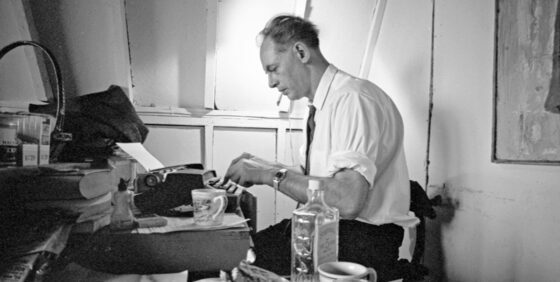 An old CanLit staple whose braggadocio feels out of tune with the relative civility of contemporary Canadian letters, Al Purdy is a fitting subject for Brian D. Johnson’s doc, which also feels a bit out of time. Al Purdy Was Here operates as both an extended eulogy for the scrappy poet as well as an institutional history of the A-frame Prince Edward County cottage Purdy transformed into a kind of rustic artists’ retreat and salon for the likes of Margaret Atwood and Michael Ondaatje. The mostly assured trafficking between a chronicle of Purdy’s career and an assessment of his literary and familial legacy is the film’s main strength, but also something of a liability. Nick de Pencier finds a haunted quality in his Edward Burtynsky-inspired aerial photography of the present-day remains of Purdy’s old stomping grounds, and Johnson weaves some resonant threads in his smooth cuts between archival footage of the younger (though still middle-aged) Purdy and those who’ve survived him. More curious is the structural gambit to introduce Purdy to novices through the adult-contemporary stylings of Canadian singer-songwriters like Doug Paisley and Sarah Harmer, who occasionally halt the narrative to offer songs inspired by the faintest outlines of Purdy’s life and work, adding a further coating of dust over the actual poetry rather than revealing it to fresh ears. (A later number featuring Tanya Tagaq and Joseph Boyden has a bit more teeth, but also serves to reinforce the genteel whiteness of the other participants.) The message that any artist worth his or her salt leaves a long trail is a nice one, but it is better served by Johnson’s interviews with weathered colleagues like Atwood than by Harmer and company’s more impersonal occasional poetry on the subject of, say, Purdy’s magnanimity as a host.